The Association of Stylists and Barbers invites you to part II of the evening events on July, 22, 2018. Our TASB Hair Battle, Round 2. Our event is open to the public. Check out amazing talent as stylists, barbers and students compete for that amazing new look. It’s not just a hair battle but a battle for knowledge, motivation and success. We all need a reboot! TASB will also bring out the amazing speakers on how to get a grip on Bullying, low self esteem and suicide that’s combing the nation. We want to knock these issues clear out of the ring. 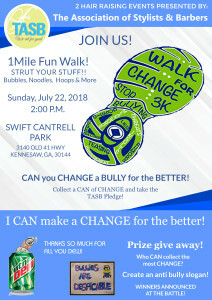 This event starts after the walk, at 4:00 p.m. at Mirella’s Hair Salon,2726 Summer St. Kennesaw, Ga.
Open to the public, Bring your change and Take the pledge. Raffle Tickets and Silent Auction. PEOPLES CHOICE- 50/50- YOU CAN’T GO WRONG WITH A 50/50. EVERYONE WINS!! Get the support of your family, friends, colleagues and clients. Each category you will have a chance for your fans to vote by giving YOU- $$$ change for support. Let everyone know between now and July 17th you are battling with the best barbers around the states and you need their support. The funds you raise will be divided 50% for you to keep and 50% will benefit TASB Day Retreat. 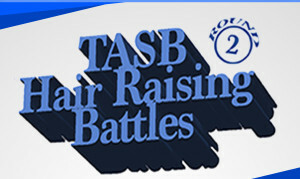 The battler from each category with the most support (funds raised) will be awarded by TASB. 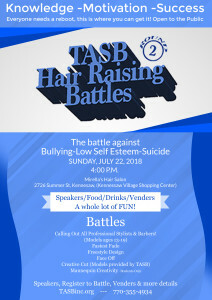 GUEST CATEGORIES- TASB will provide a number of models who are in need of their spirits/low self-esteem lifted. Battlers will assign chosen models and be judged on their new hair style. The winners will be awarded by TASB. Models limited! Students can enter as many mannequins as they like. You can have your mannequin represent you as an individual, your school or a team. Stylists & Barbers can join this category if not enough students register before July 14. call for conformation. WHO: An elite group of Stylists and Barbers, across the states are giving their community their professional talent and valuable time to a cause important to them, Autism. WHAT: It’s simple, Create Autism Awareness with your colleagues and clients in many ways: Give several or just one hair cut to the cause or display silent auction items. Everyone likes raffles! Businesses in your community are always anxious to team up and create awareness for the cause. Raffle off products/services or create a lottery tree . Volunteers looking to build up their clientele can promote discounts off haircuts or donate 50% of your funds raised. Keep it simple or jazz it up and have a lot of FUN! WHEN: The weekend before the Labor Day Holiday is our Opening Celebration. For 6 weeks, choose date(s) that work for you. Contact TASB for your dates, 770-355-4934. TASB materials, media coverage, etc. are dedicated to these dates. We end our celebration with Closing Celebrations. WHERE: Become a Host at your salon or barbershop and represent your community. Hotel lobbies, schools, shopping malls, parks etc. are options too. First time volunteers can get their feet wet and join a host. Come together with neighboring salons/barbershops and make it a unique event in your area. 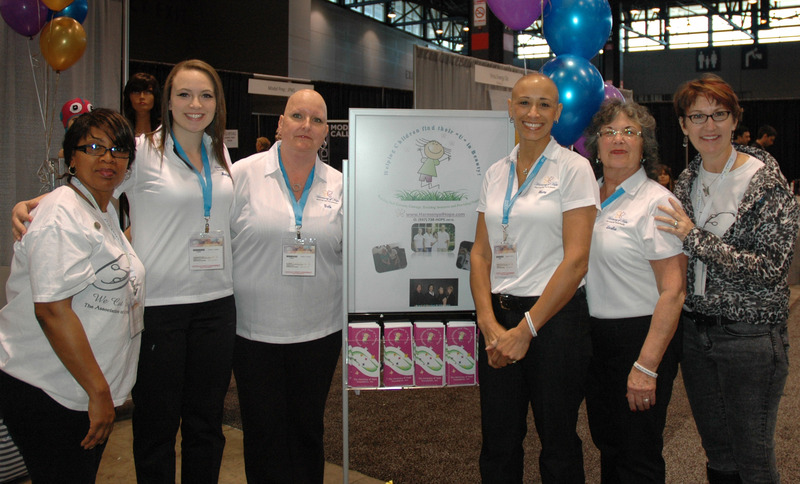 WHY: To date TASB volunteers have raised $60,000 for Autism and to keep TASB thriving. It is an opportunity to promote your salon/barbershop, give recognition to a cause dear to our hearts and create a buzz in your community. We invite you to be a part of this “Hair- Raising movement”. Check out our magazine, Recognition with Style, to read testimonials and see why your colleagues celebrate our TASB Cut-a-Thon. My friends we truly are strong in numbers! Register so we can keep track of who is on board and to send a welcome packet with items that will help you have a successful event. Print your materials that you would like to use from our Gallery. Share your event (beginning to end) on our official TASB Cut-a-thon site.